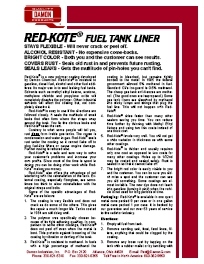 Red-Kote is an internal fuel tank liner designed to seal leaks and prevent further rusting. 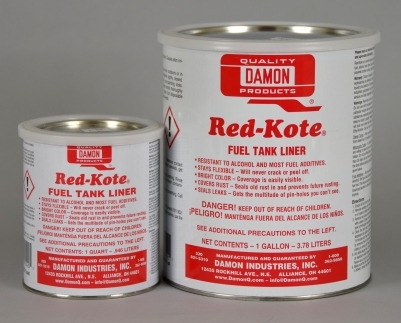 As a sealant, Red-Kote excels at sealing the often hundreds of pin-hole leaks that occur along seams or where straps wrap around the tank. Once in place, Red-Kote forms a very tough, flexible membrane that will never crack or flake as many competitive products do. Red-Kote will not plug lines or cause engine damage when used properly. Future rust will be prevented because condensation will not contact the metal. A partial list of additives that Red-Kote is resistant to includes ethyl alcohol, methyl alcohol, toluene, methyl tertiary butyl ether, isopropyl alcohol and tetraethyl lead. Red-Kote takes approximately eight hours to dry. Packaged nine quarts per case. Over-Kote Plus takes the mess and hassle out of fuel tank coating. just brush it on and let dry. This one-step urethane coating adheres to metal tanks with one, ultra-tough coat...and it needs no mixing. Formulated with durable plastic fibers for added strength, Over-Kote Plus resists cracking, chipping and peeling. After curing, it stands up to most solvents and chemicals. 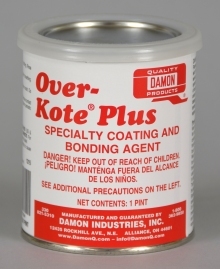 Quick to dry and easy to apply, Over-Kote Plus is revolutionizing fuel tank repair. 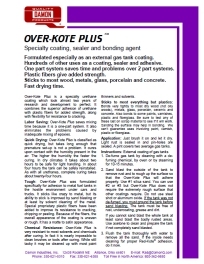 Over-Kote Plus has many other uses where a protective resistant coating is needed. See our tech sheet for ideas. Over-Kote Plus is packaged in 12 metal pint cans per case. Red-Kote is sold in Australia by Fuel Tank and Radiator Service. Red-Kote is sold at O'Reilly Auto Parts stores. Click here for their store locator. If you are in the Lower 48 United States you may order direct using the links shown. You may also buy Red-Kote by visiting an O'Reilly Auto Parts Store. Scroll down for links to Canadian and Australian inporters. For Alaska, Hawaii and other countries, please e-mail info@DamonQ.com or call 1-800-362-9850. Shipping to Alaska and Hawaii is about $250 in addition to prices shown and to most other countries is $350 additional. If you place an order from other than the continental U.S. your money will be refunded and we will send you a price quote for approval. © Copyright 2011-2018 by Damon Industries, Inc.